Prestbury St Mary’s C of E Junior School – Outstanding! As I write this page for our now award-winning parish magazine, the view outside my window is of a sunny and warm garden, with a gentle breeze and evening birdsong, yet also with a fine rain falling. We are definitely moving into the months of summer, which we are told are going to be particularly warm and dry this year, yet there is a reminder in the rain of what we are moving into summer from, and what will come again after. A reminder that this is a part of a cycle, something that happens over and again, albeit with some variance. And so it seems appropriate that I write this for a time when I shall have been in post in Cheltenham for a year. Last summer, many folks grumbled of how damp the weather was on the whole, but one of my abiding memories from that time is having to drive with the windows of the car open, because the sun did in fact shine, and the air was in fact warm. It seems appropriate, too, to speak of cycles, because on the sixth day of June I shall be ordained. Again. This may strike you as rather odd. ‘Ordained again?’ you may be wondering, ‘why on earth does he need to be ordained again? Was there something wrong with the last one?’ Well, no, but although I am being ordained again, and again I will face Bishop Michael in Gloucester Cathedral, and although this will follow a three-day retreat at Glenfall House, and although my job title ‘Assistant Curate’ will not change, there is something rather different this time around. Last year I was ordained and sent to minister amongst you as a Deacon, a servant of God’s people tasked with accompanying them along their spiritual roads. This time, with the permission of Bishop Michael and the blessing and assistance of the congregation of Gloucester Cathedral, and indeed all who worship in our North Cheltenham Team, I will be sent back to you as a Priest. What does this mean? The most visible difference is that I will be able to preside at the Eucharist and other services on my own. Where before as a deacon I have assisted one of our other Priests at the altar, I will be able to conduct the entire service myself. I will be able to pray God’s blessing upon people, baptise in formal services, and marry couples. While as your Curate I will always remain your servant and companion on the road, as a priest I hope to be able to minister to you in whatever capacity is needed, and also to help my colleagues to better serve our whole team, here in North Cheltenham. As always, however, this ministry is not one that can be accomplished through my own strength or capabilities alone, and so in this month I ask you especially to pray for God’s grace for me and for all those being ordained this year. On Saturday 6th June at 4.30pm Fr David will be ordained priest in Gloucester Cathedral. We hope that he will be well supported by members of our North Cheltenham Team Ministry. On 7th June (Trinity Sunday) Fr David will preside at the Eucharist for the first time. This is a very significant occasion for a new priest and one which we would all want to share in. As this will be a Team-wide celebration we will not be having services in any of the churches of the Team Ministry at the normal times in the morning apart from a Said Eucharist at 8am in both St Mary’s and All Saints’ and Celebrate! at 9.30am. The main Sung Eucharist for the whole Team, at which Fr David will preside, will be at 11am in St Nicolas’. This will be followed by lunch. If you would like to attend the lunch please sign up on one of the lists which are on display in each church. On Sunday 28th June Jennifer Swinbank will be amongst those who will be ordained deacon in Gloucester Cathedral. Many of you will already know Jennifer, who has been a member of All Saints’ for a number of years. She has spent the last year at St Stephen’s House Theological College in Oxford as part of her training for ordained ministry and will be ordained to serve in the North Cheltenham Team. This will be on a non-stipendiary (unpaid) basis and Jennifer will be continuing her full-time work in the National Health Service. Although she will mainly be ministering at All Saints’ she will also be involved in Team-wide services and other events and so will have the opportunity to meet many of you. Fr Andrew, who spent the first six months of his ministry with us, will be ordained priest on the evening of Wednesday 24th June in the church where he is now serving in the parish of Friar Park in Wednesbury. Fr Andrew will preside at the Eucharist for the first time on Sunday evening 28th June at the church of St Francis, Friar Park. Please keep David, Jennifer and Andrew in your prayers as they prepare for ordination and as they continue to grow in the particular ministry to which God has called them. The judgement Outstanding was given to our school by Ofsted in its recent inspection. I want to share this good news with you. The following may sound too good to be true, but it is true! The school is outstanding in all categories: Overall effectiveness, Achievement and standards, Personal development and well-being and Quality of provision. When I shared this good news with the congregation at St Nicolas’ I was aware that I was looking at present and former pupils, their parents and grandparents, some of whom went to the St Mary’s schools themselves some while ago! There was a very real sense of community. The Church Schools Review Group (The Way Ahead) states: Church schools … are jewels in the ecclesiastical crown. We are blessed in our schools here in our parish. A group of twenty pilgrims from the churches of the North Cheltenham Team travelled by car to spend the Spring Bank Holiday weekend at the Shrine of Our Lady of Walsingham in Norfolk. One could not help wondering how long the journey would have taken if we had been living in medieval times, travelling on foot or on horseback. Our 290-mile trip took five hours with a generous break for lunch and a rest for the driver. On our arrival we were greeted by Fr Stephen Eldridge and some of our group who had arrived earlier. We were escorted to our rooms carefully arranged by Colin Holman beforehand. After a welcome cup of tea in the Norton Café Bar we met for a briefing and our first visit to the Holy House for prayer, returning there on Saturday morning for the Eucharist. Saturday afternoon was free. 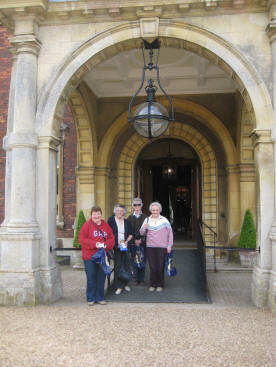 Some members of our group decided on a visit to Sandringham House and gardens, others opted for a trip to the coast to sample the bracing Norfolk air at Holkham Bay. We were blessed with fine weather. After supper in the spacious modern refectory we joined other pilgrims for a procession of the Blessed Sacrament, singing the well-known hymn. On Sunday morning everyone walked to the spacious and splendidly restored parish church for the Eucharist concelebrated by the parish priest, Guardians of the Shrine and visiting clergy. In the afternoon everyone took part in the sprinkling ceremony at the holy well, beautifully introduced for us by Bishop Lindsay Urwin, the Administrator. Our group made the Stations of the Cross after supper and our visit ended with a last visit to the Holy House on the Monday morning. The Shrine has been much enhanced recently by the addition of the Milner Wing of modern single rooms on two floors designed with a lift and rooms to accommodate disabled pilgrims. It also has a state-of-the-art Welcome Area, ideal for day pilgrims and groups of all ages. In all it was a wonderful and uplifting experience. Our thanks to those who organised the weekend. Deo Gratias! Our 2010 Pilgrimage has already been booked for Friday 30th April – Monday 3rd May. The 2009 Prestbury and Pittville Youth AGM was held on 26 April in St Nicolas’ Church. It marked the end of the first five years for the charity. Hon Treasurer, Gill Wood, presented the Annual Accounts to 31 December 2008, highlighting the fact that nothing had been added to the reserves in the year with income just covering expenditure. She stressed the importance of local support for the work with young people and the need to improve on current levels of committed, gift-aided giving. The Chairman expressed thanks to the members of the Executive Committee, in particular to Charlie Chan and Julie Lane who had decided to stand down. All the places on the Executive Committee were filled. 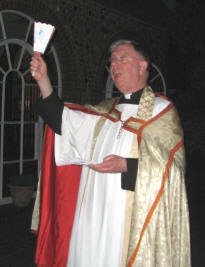 The Revd Michael Cozens was elected Chairman for five years. 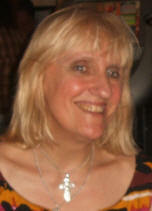 Gill Wood continues as Hon Treasurer for another year. Liz Greenhow was elected Hon Secretary for three years. Linda Biggs and Clare Wyatt were nominated by Parish of Prestbury. Jill Bradley and Julia Hook were nominated by All Saints’ Parish. Peter Horne and Tricia Wilson were elected for one year. The Chairman thanked members for their support, prayers and time and urged them to encourage others also to support Prestbury and Pittville Youth’s work with young people. PPY is five years old and we are hoping a lot of people will help us make the next five years as successful as the first five. So we are holding a ‘Consultation and Ideas Meeting’ on Sunday 21st June 2009 from 4.00 to 5.30 pm in St Nicolas’ Church. Please come along with all your ideas and suggestions. There are over 300 young people aged ten and above who join our four regular evening groups or come to our school-based or summer holiday activities. Last year they joined in a project doing art, crafts and music making. This year’s project includes open-air activities and learning about the environment. What other activities would be good? If you are a bit older, could you be a volunteer leader with one of our youth groups? Could you help spread the word about our many achievements, keep our website up to date or join a team running a fundraising event? What else could you do to support local young people? We have also produced a full colour leaflet showing our work and our young people. If you have not yet had a copy, or would like more information, please contact Tricia Wilson on 01242 572017 or . The following thoughts set our local, North Cheltenham, mission – which was discussed at our Annual Meeting in April – in the global context. The aim is to develop, over time, a strategic approach to mission across our Team in a way that is both faithful to the way of Jesus and effective in meeting the spiritual needs of our community. It should be subject to review every few years, as all expressions of the church have their own natural life cycle. When an initiative comes to an end it is important to close it in a prayerful manner, with thanksgiving, and to move on as the Spirit of God leads us. Sometimes a work is well established and ongoing, at other times it is a new thing that God is calling forth. The same guidance (above) applies in every case. It is my hope that God will stir up in us a new excitement about mission, which is not only a part of Christian life or an aspect of Church, but is God’s giving of his love to the world, a journey that will bring wholeness to all those involved with it. We began the week with a lively ecumenical service at Holy Name Hall, where Nigel Quarrell from the Bristol office thanked the people of Prestbury for their generous support and answered questions about the work of Christian Aid and over 600 partner organisations. The music group from Holy Name Hall provided good support for the hymns. Sadly the service was not very well attended; perhaps the beautiful weather was to blame. A collection of £72.80 was taken for Christian Aid. The house-to-house collection went well. Many thanks to all the volunteers who collected and counted and helped with transport to the bank. Thanks above all to everyone who gave so generously. The totals so far are £1,219.96 at St Nicolas’ and £3,954.29 at St Mary’s giving a grand total of £5,174.25 in the parish. After nearly 40 years, Paddy Spurgeon has decided that the time has come to stand down as Christian Aid co-ordinator at St Nicolas’. We pay tribute to Paddy for her dedication and commitment to the work of Christian Aid and to ensuring that the annual collection in the St Nicolas’ area of the parish has always been covered. Her enthusiastic encouragement will be hard to replace, but we must find someone who is willing to take over from her. Please speak to me if you would like to know more about this role. Very many thanks, Paddy! We thank the Churchwardens for all that they do in the Parish on our behalf. Please keep them in your prayers. Prestbury actually has four lay places on the Deanery Synod but only two of these were filled at the meeting. Since the Annual Meeting, Colin Holman has offered to take one of the vacant places and this will be confirmed by the PCC at its next meeting. If anyone would like to consider taking the other vacant place, please speak to one of the clergy or one of the Churchwardens. The Deanery Synod usually meets four times a year and has more of an overview of the whole town, which is roughly the area covered by the Deanery. Any lay member of Deanery Synod is also an ex-officio member of the PCC. We thank those who stood for office and those who continue to serve on the PCC for the time they give to this important aspect of our parish life. On Saturday 16th May we drove right into the centre of London, which felt very strange when we reached places where I have only ever been on foot! In the Methodist Central Hall, Westminster, just across the road from the Abbey, I met with fellow members of the Association for Church Editors (ACE) for a very short AGM followed by the culmination of this year’s Magazine Awards Scheme. It was a good day out, always interesting to meet fellow editors and compare publications. If you have a moment (and a computer) look at the Church of England website and see what Archbishop Rowan and others have to say about parish magazines. There is even a prayer for editors! www.cofe.anglican.org/about/diocesesparishes/parishmags. A couple of other websites you might find interesting are www.churcheditors.org and www.methodist-central-hall.org.uk. The keynote address was given by the Reverend Martin Turner, Superintendent Minister of Central Hall, who spoke inspiringly about church magazines, editors, awards and where God comes into it all. Martin considered three things important: firstly that in our magazines we are called to echo our God of creativity. There is excellent computer software available, so use it creatively. But beware our motives: am I producing a good magazine to serve my own personal needs or am I offering my creativity to God so that it becomes his magazine? Secondly we are called to echo our God who makes all things new. If the Holy Spirit is calling the Church forward to new things, then the magazine should reflect this – it is a great tool for bringing change. As editor I should spend time in prayer discovering what God wants to say to the readers. And thirdly echo our God of community. Often the church magazine is the only thing, apart from personal visits, which links elderly or housebound people with their local community. It is also a great tool for outreach – does my magazine open the door for people to find what they are longing for? 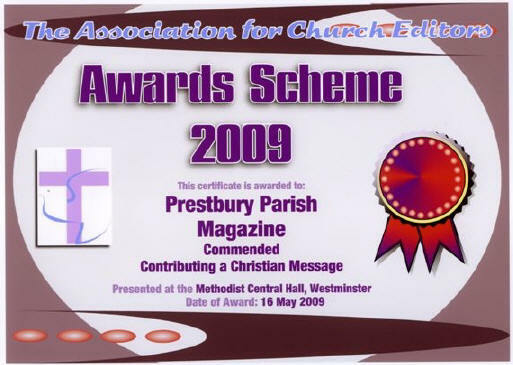 As for winning awards – Martin said the greatest achievement is the reward of serving God in all that we do, including editing and producing parish magazines. Before talking about magazines, the Reverend Martin Turner gave us a quick overview of Central Hall and his role there. It was built in 1912 as the headquarters of the Wesleyan Methodist Church. Today the building functions in three spheres: spiritual, commercial and caring. It is a multicultural church with 390 members and a major emphasis on the healing ministry. The great hall seats 2,500 but they mainly use the smaller chapel. It is also a huge conference centre, with an annual turnover of millions, but all profit is ploughed back into the building. (It costs £22,000 to clean the windows, which is done three times a year.) And it is a thriving family centre for the local neighbourhood, running such things as parenting classes, a blood pressure clinic, a place for divorced parents to meet their children under supervision, and the café in the basement is open to the public. At the end of the afternoon we were taken on a tour of the building, including stepping out on to a balcony roughly level with the clock on the west front of Westminster Abbey – a view very familiar to all of us because that balcony is where the television cameras are always situated during any event involving the Abbey. After lunch we had a short talk on the birth of the parish (or church) magazine as we know it today. In January 1859 the Revd John Erskine Clarke in Derby published a 16-page booklet called The Parish Magazine containing articles about Christian devotion, Church teaching, natural history and biography, poetry and a short sermon by a notable ecclesiastic such as Charles Kingsley. This was available each month to parishes throughout the country, who could buy as many copies as they needed and insert them into their own locally printed covers. Other similar publications followed in due course, including The Sign in 1905. Our own Prestbury Parish Magazine started in 1885 in exactly that format: a cover and four pages, with the 32-page The Gospeller as its nucleus, replaced the following year by Banner of Faith. And this was still the case as recently as 1972: our own distinctive cover, a few pages of Prestbury parish information, and The Sign stapled in the centre. The Awards Ceremony itself took up the rest of the afternoon, with much posing for photographs when receiving certificates. The 78 entries had been judged according to six criteria, with a winner and maybe one or more commended or highly commended in each category. AttractiveCover was inevitably won by a glossy full-colour-print magazine (we’ll get there one day!). Then there were Overall Layout, Use of Headlines, Use of Graphics, Clarity in Communicating a Christian Message and Appeal to the wider Community. Our magazine was commended for communicating a Christian message. I was particularly pleased because this is one aspect of our magazine which I felt needed addressing after the feedback from the competition four years ago. We have always had a Christian message in the front page article, usually from a member of the clergy, but now we also have a series of articles by lay people reflecting on passages from the bible, and quite often one or other of you writes about a service which has moved you, or a helpful quiet day or retreat, or maybe comments on Lent or Advent study groups. I have not yet received our magazines back with the judges’ comments from this year’s competition, so I shall wait till next month to discuss how well we scored in all the other categories. So where do we go from here? Well, I shall keep on doing my bit, but you must also keep on sending me the articles – long ones, short ones – and the photographs. And when you have read your copy of the magazine, pass it on to someone else. Above all, pray – for the writers, for the readers, for the production team. Pray that God’s love will move through our pages, and through our website, to reach those who need him. Frances is too modest to say so herself, but the excellent magazine which we all enjoy and which the judges commended is largely a result of her dedication as editor. On behalf of us all I would like to congratulate Frances on a well-deserved award and on the continuing high standard of our parish magazine. What does the song Amazing Grace say to you? Every time I hear it sung, by professional artists, a congregation in church or a group of elderly people in a nursing home, it still has the power to send shivers down my back! But why? What is so special about it that makes it stand out from so many other songs? Have you listened to the words, truly listened to them, so that they touch that inner space deep down in your heart, perhaps your soul, and realised the power, the strength of God’s love which is indeed amazing, and which is given to us so freely through the grace of our Lord Jesus? What do we give in return? Do we go out and tell people of this love? Through our many acts of worship, through prayer and by our giving of our time and talents, we try to do what we believe God would want us to do. Most of this is done in a quiet way, doing as Paul tells us we should, without boasting of our good deeds, and if we follow the words of the passage, Paul says that whilst we are free agents and can choose the lives we lead, if we have faith, however small, and let God guide us, He has prepared a whole way of life for us. That really is quite awesome!! At a time when we are being threatened by credit crunches, a pandemic and it seems that the integrity of numerous hitherto unknown politicians is highly suspect, when the media tells us, however, that we deserve and should expect perfection in every area of our lives, because ‘we’re worth it’, where does God come into the equation? To many He doesn’t, in fact, too many people are not even aware of His great love. So what can we do about it? We do not like standing out from the crowd, we do not want to make a fuss; most of us have mundane predictable lives that have the odd tragedy or disaster in them, and often only then do we find our faith deepening as we lean on God for support. Or maybe we don’t: whatever has happened could also weaken our belief, as we ask ourselves, ‘How can God do things like this to us?’. Yet God made us so that we could perform ‘good works’ for him; and how can we do this without going out and telling people about him? Here too we should maybe look to Paul, who ignored the people who mocked him, who imprisoned him, and just carried on telling everyone he met about the great love of God and that by the grace given to us through Jesus, we would be saved. There are people all around us who try to make religion a joke, but who deep down are searching to fill the emptiness of unfulfilled lives, and these are the people that we should be trying to bring to faith. Maybe they will never step into a church or profess belief, but if we can give them the basic knowledge that Jesus died for love of them, then we have sown a seed which could grow one day in God’s own time. The bakestall this month falls, once again, on Father’s Day, Sunday 21st June, and this is the turn of the A-F team. In April we were able to send two charities £25 each: Practical Action and Mission Aviation Fellowship, while in May our proceeds were directed to the parish collection for Christian Aid. If you would like to join one of our teams, please let us know. As always we are very grateful to all who support the bakestall each month. This month’s meeting will take place on Tuesday 23rd June at St Mary’s Church at 7.30pm. Julie Jefferies from the URC will tell us about her recent trip to Kenya and the work that was undertaken whilst they were there. Anyone is welcome to join us to hear about this worthwhile cause. In July we will have our outing to Winchester Cathedral so there will not be a meeting that month. Music Scholars from Dean Close School will entertain us on Wednesday 24th June in St Mary’s church. Coffee is available from 10.30am and the recital starts at 11am. Entry is free but there will be a retiring collection for the organ fund. All are welcome. Please support the fete again this year. There will be all the usual stalls, plus a bouncy castle, dance display, BBQ and much much more! Daphne and Allan are organising another ‘Doggy-Gymkhana’, so please contact them if your dog would like to take part. If you could start collecting items for the stalls – books, CDs, toiletries, toys, games, bottles, soft toys, bric-a-brac and china – we would be happy to ‘house’ things a little nearer the date of the fete. We have had a good response to our invitations to find out more about Alpha. However, all those who responded said they would like to do it in the Autumn rather than now, so the launch supper will take place in September. 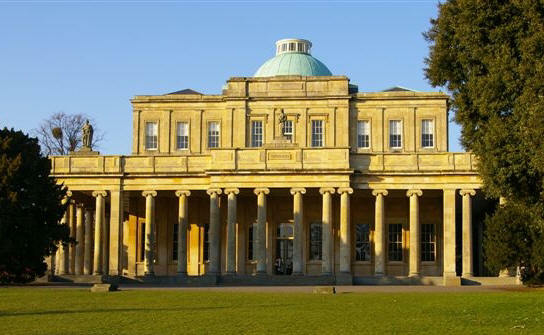 Please keep praying for all our North Cheltenham folk, especially those who have not yet made the Good News their own.